With the final installment of the Sunday Gorey Sunday gallery, pictures from all three days of the 9th annual San Francisco Edwardian Ball are now online. Sunday took place in the wood and red velvet room at the top floor of the Regency Ballroom, and was a decidedly more intimate (and dimly lit) affair. Performances included those by Oryx Incruentus (Andrea Zerilli, guest Paul Mercer) performing to the 1911 silent film “L’Inferno,” The Ghosts Project (Paul Mercer, Minka, Davis, and guests Jill Tracy, Nathaniel, Erica) with Finn from Abney Park dancing, Shovelman, Lee Presson, Alison Lovejoy, and Agent Ribbons. Non-musical acts included Finn from Abney Park dancing to the Ghosts Project, Evil Sarah (burlesque), Helios Jive (the buffoon clown), Fou Fou Ha!, and several vignettes from the Vau de Vire Society (like the incredibly-difficult-to-photograph swinging-’round-the-room rope act pictured above). Tonight, via horseless carriage, I do depart for the arid southron lands of the City of Lost Angels for their installment of our grand affair at the historic Tower Theater tomorrow night. Go here for details. It is one of the “only in San Francisco” sort of affairs in which we love to indulge, with thousands of people decking themselves out to the nines for three days of decadence in the extravagant and recently beautifully renovated Regency Ballroom center (Mike Vau de Vire told me they were pulling the blue painter’s tape off on Friday during setup). Having moved from the Great American Music Hall, where the Ball has been held in prior years, there was some concern as to whether the much larger Regency Ballroom could be filled; after three days of packed halls, that question has been answered. Saturday was the main night of the ball, with the headliner and chanteuse Jill Tracy playing with the Malcontent Orchestra, and later the hosts Rosin Coven, accompanied with performances by Cirque Berzerk and Vau de Vire Society. These may be my favorite costumes of Friday night — click here for the gallery. Friday night was steampunk-themed (though not explicitly advertised as such so as to avoid offending us purists), but brass and goggles and steam-powered contraptions were certainly donned by many an attendee, and those self-ascribed purveyors of steampop Abney Park definitely put on a great show. Rounding out the lineup musically were those corseted and quirky Rasputina, of whom I am a fan (what’s not to like? women playing cello, corsets, songs of nonsense and tomfoolery sung with a straight face? Indeed). Sunday’s gallery is coming as soon as I finish editing the 1,000+ photos I shot for it. Check back Thursday night — they had better be up by then, for the next eve I depart for an additional fix of hats and corsets at the Los Angeles edition of the Edwardian Ball at the Tower Theater. (You should go). And did you know I added a “prints” section? 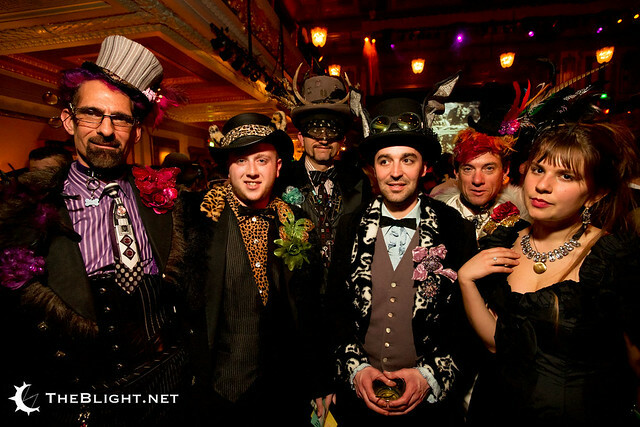 Edwardian Ball 2009! Also, Dickens, Post Yule Pyre, and Sea of Dreams photos. 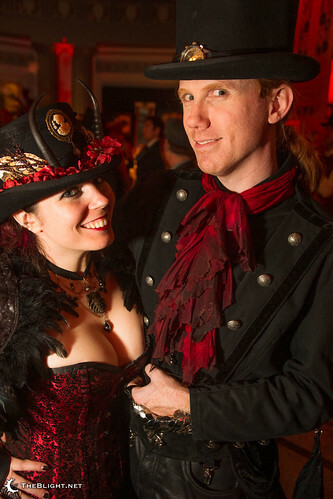 The San Francisco and the Los Angeles Edwardian Ball! I’m delighted to be the official photographer for this extravagant event, and am honored to share the bill with some of my favorite and most talented artists (including Jill Tracy, Paul Mercer, and Rasputina). and Sunday if you want the luxury of the red carpet and the ethereal soundscapes of the Ghosts Project. You should go so that I might take your photo. It will be my job (though you’re still welcomed (and encouraged) to buy me a drink. Really.). And I can’t tell you which to use, but if you enter “belle” or “hubba” as a discount code, you’ll get $5 off your ticket price (I’m not special enough to have my own discount code). Pictured is Andrea Zerilli of Oryx Incruentus (who, incidentally, will be playing at the Edwardian Ball) playing a harp in one of the shops — she claims she had no idea the chair had wings. I could have shot (considerably) more, since it was a great party (selling over 8,000 tickets, the rumor went), but due to budget concerns, I was not hired by Anon Salon (though they gave me free tickets) and so I instead elected to shoot only those folk who did ply me with free drinks (these things go far, people). Next year, however, I suspect I will elect for something markedly more quiet (though we’ll see if I keep -that- promise). …wherein everyone coincidentally showed up with a dried-up dilapidated Christmas tree in tow… and then proceeded to place them in a large pile where they spontaneously combusted. Honest to God, officer. Coming up on Friday the 19th of this month is Hubba Hubba Revue — Christmas Special. I shall be your photographer for the evening. Then, on Saturday, December 20th, your favorite circus troupe Vau de Vire Society, joined by the buffoons of Fou Fou Ha! and the goofballs of Gooferman will entertain you with not one but two (2!) shows at the decadent Palace of Fine Art in San Francisco. The first show is family-friendly (shocking, I know) and the second a bit more like you’re used to (similar to Cirque du Soleil meets burlesque with a two-drink minimum). Get your tickets here: www.storytimefestival.org. I’m the official photographer for this event. And, coming up in January is the inimitable and fabulous Edwardian Ball, about which I’m sure you’ve heard so much. Three days of yesteryear decadence are yours for the taking, and tickets are available here: www.edwardianball.com. I am most delighted to be the official photographer for this event as well (an honor, indeed). Also upcoming is the Sea of Dreams New Years Eve bash by Anon Salon, at which they’ve asked be to be a photographer (but negotiations are yet underway). It’s very likely you’ll see me there, joining my friends The Mutaytor from Los Angeles.